Forgot your pen? 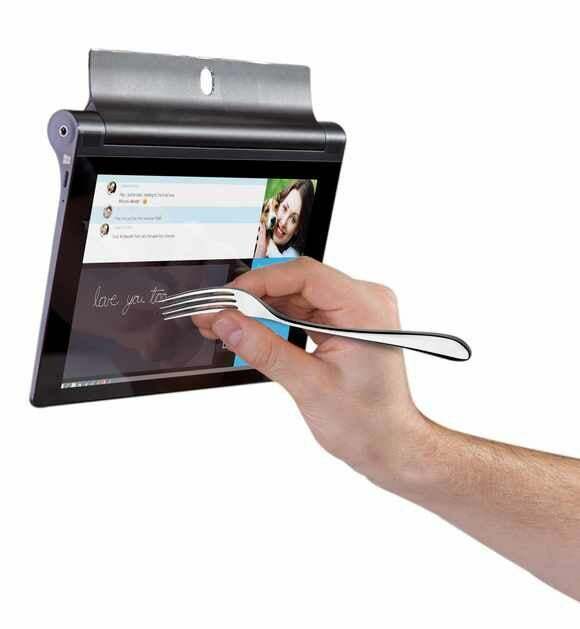 No problem, the Yoga Tablet 2 Anypen lets you write on it with a pencil, pen or even a fork. When last I communed with a Windows-powered Lenovo Yoga Tablet 2 (the 10-inch version), the experience was soured by the worst auxiliary keyboard I’ve ever experienced. 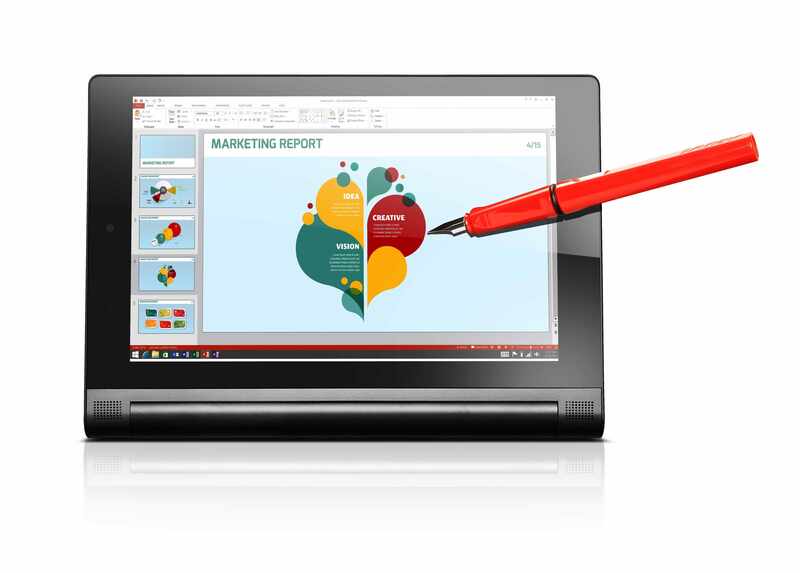 Thankfully, Lenovo didn’t see fit to saddle the Windows version of the smaller $300, 8-inch Yoga Tablet 2 Anypen with something similarly irritating. 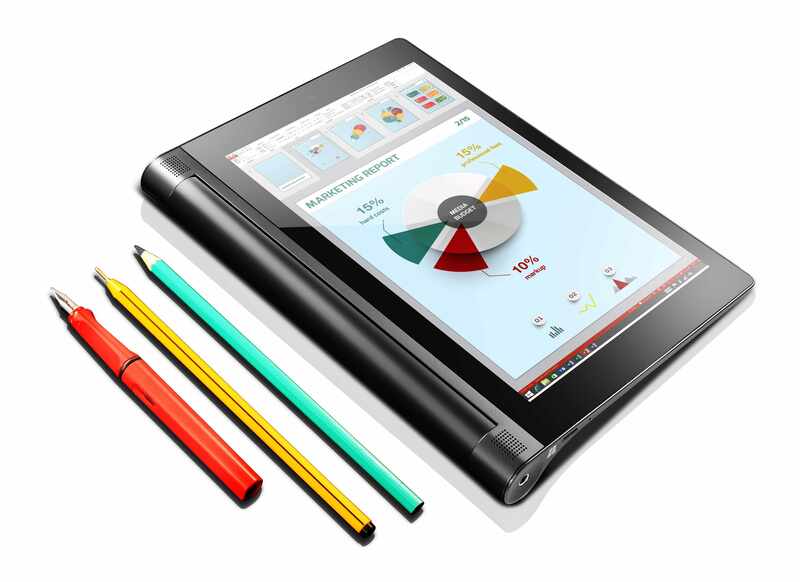 The Yoga Anypen is a neat little tablet with an innovative design and versatile digitizer, though not necessarily a platform for serious business use. The headline feature of the Yoga Tablet 2 Anypen is its advanced digitizer. You can use a pencil, ballpoint pen, or just about anything with a metal tip 1mm or larger. Most digitizers require a capacitive stylus with at least a 5mm tip. You might want to avoid X-Acto knives, but other than that you’re good to go. You may of course, also use your fingers. Another unique aspect of the Yoga Tablet 2 design is the cylinder running along one edge that allows for a far larger battery than a normal, flat tablet can accommodate. The battery tube also allows a grip that uses all your fingers, yet doesn’t place your thumb near the display. Many is the time I’ve accidentally flipped pages on an iPad Mini. The Yoga Tablet 2 (both sizes) has a distinctive kickstand that jackets the battery tube. It clicks into place at about 42-, 85-, and 180-degree angles, but you can manage angles in between due to the large amount of friction. Even more unique is the hole in the kickstand for hanging the Yoga Tablet 2 on a wall, for storage or an ad-hoc cinematic experience. The cylinder at its base lets you grip the tablet and also lets Lenovo put in a massive 6,400mAh battery. Beyond that, the Yoga Tablet 2 Anypen (with Windows) is, well, a smallish Windows tablet running Windows 8.1. Its outstanding feature in that regard is the free year of Office 365. Hardware-wise, you’re talking a Bay Trail Atom Z3745 CPU, 2GB of DDR3/1066 system memory, an 8-inch 1,920x1,200 touchscreen display, and a 32GB eMMC SSD. Generally nice specs, but not a lot of disk space for running Windows. Indeed, with only 19.7GB of free disk space before we installed anything, we were unable to use our 20GB data sets for read/write testing. The Yoga 2’s performance easily eclipses the older Atom used in the S12 Netbook, but the newer Surface 3’s Cherry Trail Atom clearly stays ahead. In my hands-on, the Yoga Tablet 2 Anypen seemed lively enough, but the numbers are strictly Atom: PC Mark 8 rated the tablet at 1,375 in the work test and 897 in the creative test. 3D Mark didn’t measure playable frame rates until it got to Ice Storm Extreme, a Web graphics game where the Tablet 2 Anypen scored 7,967. While that’s quite nice compared to last generation Atoms, it’s not Core-like. 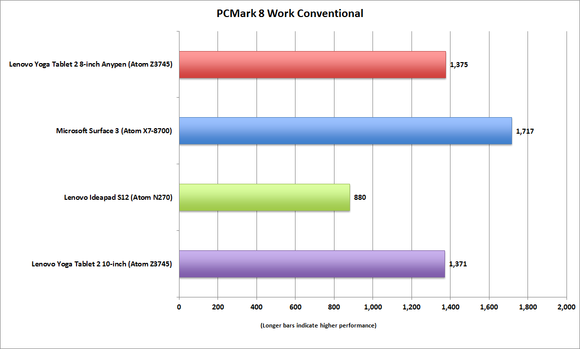 Overall performance, in fact, is pretty much identical to the 10-inch version's. In fact, you could look at the 10-inch Yoga Tablet 2 results from our Surface 3 review and pretend it's the 8-inch version and not miss a beat. Regardless, there were no frustrating waits thanks to the Samsung MBG4GC SSD, which scored 168MBps reading and 75MBps writing 4MB files under CrystalDiskMark. That’s quite good for an eMMC-based SSD. Battery life was 6 hours and 58 minutes, and that’s measuring with PCMark’s battery rundown test, which works uninterrupted. Unless you drink a lot more coffee than I do, you can add a few hours to that figure. The Yoga Tablet 2 Anypen rendered 1080 movies quite nicely, and the sound is adequate. There’s plenty of volume, enough to create distortion if you crank it up all the way. The stereo separation is also better than average, due to the placement of the speakers on either end of the battery tube. The microSD card slot on the back can expand storage if you want to keep a decent collection of movies on board. The only ports on the Tablet 2 Anypen are the headset jack and the micro-USB port, which can be used for temporary storage as well as charging the unit, or conversely, charging other devices. Having that large battery on board is handy. The Wi-Fi is 802.11 a/b/g/n, and there’s Bluetooth for connecting peripherals. Alas, there’s no WiDi or even MHL support via the microUSB so with the lack of video ports, you really are stuck with the 8-inch display. As with any tablet worthy of the name, there are cameras: an 8-megapixel back-facing for snapping photos, and a 1.6-megapixel front-facing for Skyping and the like. When it comes to mobile computing of the business kind, I generally recommend larger displays and keyboards. My theory is that usage far exceeds tote time, so go for the best computing experience. However, when it comes to tablets, smaller means lighter (the Anypen weighs a measly 0.94 pounds) and easier to hold. As the Yoga Tablet 2 also comes in Android flavors, though without the Anypen digitizer, the display-size (8- or 10-inch) buying decision is complicated. The 8-inch version is better as a tablet, but should you then be opting for Windows? For real work, the screen items and text are small even when you magnify to 150 percent. I had to skip all the way to 200 percent (a custom setting) before my admittedly bad vision was comfortable using Windows. At that point the extra pixels are basically wasted. The 8-inch Yoga Tablet 2 Anypen (with Windows) is a nicely realized tablet with long run time that lets you use just about anything as a stylus (I used a fork once). For tablet tasks, and the occasional light business chore, by all means. For extensive business usage, opt for the 10-inch Yoga Tablet 2 but forgo Lenovo’s misbegotten BC800 keyboard. Or, if I’m really going to be honest, buy an 11- to 13-inch laptop.